THERE were many occasions when Manchester City Council could have retreated from this row with good grace and thus retained £3.5m of public money. Plain as day Manchester City Council effectively said, "Stuff you. We know best we always do, this democratic city is run on our terms not yours." The result is now plain to see. A dark and grim intrusion in the supremely elegant space of Library Walk. 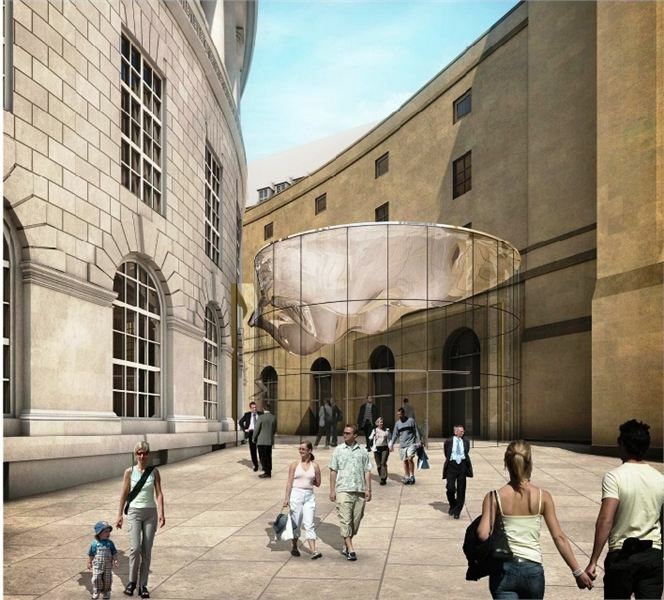 There has been a public outcry since the moment the city council sneaked in a planning application for the new 'link entrance' between Manchester Central Library and the Town Hall Extension. The fact they used such subterfuge without the press releases they'd issued for all the other aspects of the St Peter's Square development was telling in itself. Confidential wrote the first general article about this in March 2012 here. Uproar followed and the indefatigable Friends of Library Walk was formed. Planning was opposed. Every chair in the public gallery while planning permission was being granted was filled by people opposed to the Library Walk link. These included people with far more aesthetic sense than anything the council could muster. The campaign went on, the council built the 'black blob', there was a public enquiry that took months. Despite the clear reasoning of the Friends of Library Walk, the bureaucracies of council and a weak national inspectorate came together to crush sense and logic - click here. All along in this three-year process the council has been given the opportunity to respond to the ground swell of informed public opinion. 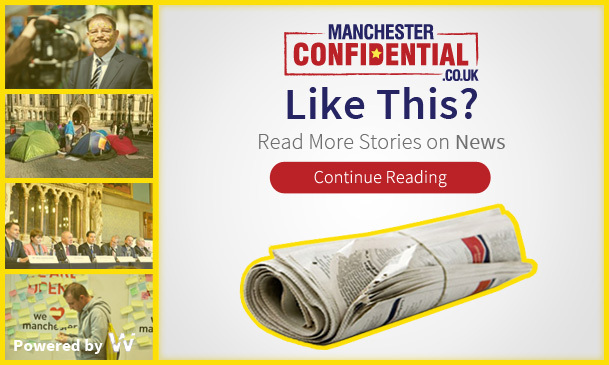 All along, plain as day, Manchester City Council effectively said, "Stuff you. You don't know what you're talking about, we know best we always do, this democratic city is run on our terms not yours." Campaigners looked at the utter shambles of Piccadilly Gardens and shuddered. So in times of extreme austerity for the citizens of Manchester a £3.5m black blob of glass that provides a covered link across five metres of space has arrived. That, in a way, is the ultimate puzzle. Not once has there been a clearly articulated reason why such an expensive solution for such a narrow gap is justified, especially when the architects of the refurbished Manchester Town Hall Extension and Central Library had already provided disabled access and a wonderful link under Library Walk. Indeed this new black blob is so useless that on the St Peter's Square side it has to have a sign above the door that reads 'Entrance'. Any public building that has to tell you where the entrance is has failed immediately. At the same time maybe the council should be prosecuted under the Trades Descriptions acts because the tall, refined, almost transparent building shown below - without its 'entrance' sign - seems a long way from the squat dark reality. After the public enquiry the Friends contemplated taking the decision to Judicial Review but it would have been ruinously expensive and probably fruitless. However they are preparing a roster of serious complaints against the council. One of these is about the sneaky set of bollards that has been imposed in St Peter's Square - see above. Presumably these have been inserted because the council are worried the link will be be ram-raided. This is a fine irony given one of the excuses for the Library Walk link intrusion was to prevent crime in a 'dark alley'. The bollards also hinder access. It's revealing that disabled rights groups were a key part of the Friends of Library Walk campaigners, but again they were ignored. And finally we come to the last broken promise. Back in 2012 as part of the illogic of providing the link building the council had to plan gates at the Mount Street end of Library Walk. They had to do this because by creating the Library Walk link building they were also creating a deep cul-de-sac perfect for use as a Saturday night urinal. So to sweeten the pill they promised 'commemorative gates' subject to a 'separate design competition'. There has been no separate design competition. The gates that have gone up look like they were bought from a garden centre. 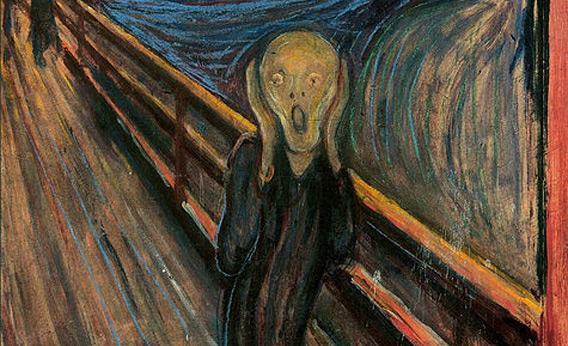 The design on them looks like Munch's 'The Scream'. How apt. I asked the builders about the design. "It is the ceiling of the egg," said a workman. "What's the egg?" I asked. "You know the new link between the buildings, that's what it's called," he said. "If you look up from the floor this is the pattern you'll see in the ceiling." So the 'commemorative' design commemorates itself, marks the blockage imposed on Library Walk. Truth is it commemorates the failure of a council to listen to its citizens. If we have an 'Egg', it's addled.